PT Kawasan Industri Wijayakusuma (Persero) - KIW or known as "Wijayakusuma Industrial Estate Semarang" is a reputable state-owned company in Indonesia that deals with industrial zone management services. 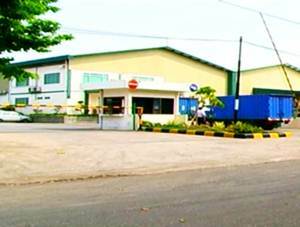 Wijayakusuma Industrial Estate Semarang engaged in the field of industrial plots sales and warehouse rental. Based in Semarang Central Java, Wijayakusuma Industrial Estate Semarang now has 250 hectares of industrial area located in the most strategic place in the Central Java province. PT Kawasan Industri Wijayakusuma (Persero) was initially established in 1988 under the name of PT Kawasan Industri Cilacap (Persero) and based in Cilacap Central Java. Later in 2008, the Company relocated its head office to Semarang changed its name to PT Kawasan Industri Wijayakusuma (Persero). At present, PT Kawasan Industri Wijayakusuma (Persero) is 51.09% owned by the Government of Indonesia, 40.39% by the Central Java Provincial Government, and 8.25% by the Regional Government of Cilacap Regency. In 2014, the performance of PT Kawasan Industri Wijayakusuma (Persero) is showing good results. Wijayakusuma Industrial Estate Semarang booked total revenue of Rp 78.7 billion in 2014 in 2014 grew by 52.51% from Rp 51.6 billion in 2013. Total profit after tax in 2014 amounted to Rp 45.3 billion or equivalent with an increase of 58.94% over profit after tax recorded in 2013 of Rp 28.5 billion. This figures was stated by JobsCDC.com from the Indonesian State-Owned Companies (SOEs) profile 2015 issued by the Ministry of State-Owned Companies. Background in Bachelor Degree (S1) from the faculty of Economics, Engineering and Law. Minimum accreditation BAN PT "B" with minimum GPA of 3.00. Computer literate, minimum Microsoft Office (Excel and Word). Active in English language with minimum TOEFL score of 500 (certified). Maximum age of 28 years old on November 2016. JobsCDC.com now available on android device. Download now on Google Play here. Please be aware of recruitment fraud. The entire stage of this selection process is free of charge. PT Kawasan Industri Wijayakusuma (Persero) - Fresh Graduate Staff KIW November 2016 will never ask for fees or upfront payments for any purposes during the recruitment process such as transportation and accommodation.